Everything tile, art and mosaics. Currently Vickie is working on new Litchfield Park logo mosaics and hundreds of round orange tiles for the new Litchfield Pedestrian Underpass near the Wigwam in Litchfield Park, Arizona. The six mosaic panels were installed at the Kroc South Mountain Salvation Army Community Center May 2012. Vickie worked on the Kroc South Mountain Community Center project making tiles with the Rose Linda school children, area families and volunteers who came to her studio for two years. 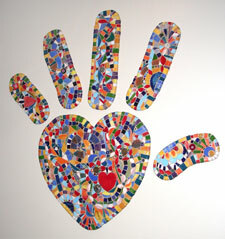 See the ongoing progress of the children and volunteers making the tiles for the mosaic in Vickie’s blog. All of the tiles are handmade and no two are the same. 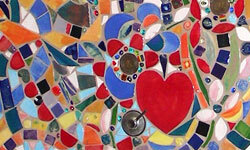 Each tile represents each individual who works at Phoenix Children’s Hospital. There are objects representing where people have been and where they are going. Anderson Home in Silverleaf, DC Ranch, Scottsdale Arizona. Mosaic Designed for Tuscan style outdoor living room using 1″ onyx, travertine, marble and gold leaf tiles. 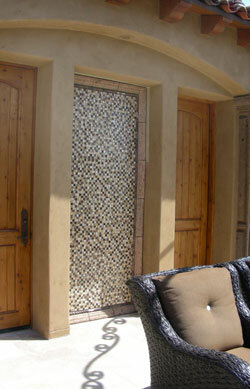 Frame and trim are travertine and cantera stone to match the existing home details.